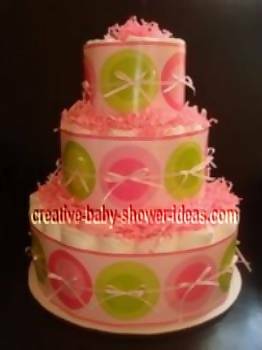 Thank you for visiting our page on Mod Mom diaper cakes. We hope the ideas shared by our readers here will inspire you. Ypu can view another category by clicking on the index below. We would also love to see your photos! Share them with us here. For this cake, I used 1 8 oz bottle and added a travel sized pack of Johnson and Johnsons. 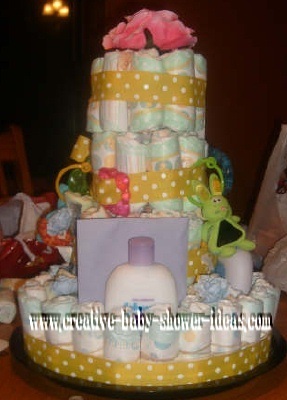 I followed basic diaper cake instructions, I just used more diapers. I used a large bottle of baby wash and lotion rubber banded together for the base of the 2 bottom layers. For the top 2 layers and tier we used a box/tube of A&D ointment. The other stuff was hidden inside the cake. I think doing it this way as opposed to using the gifts to "decorate" the outside looks more smooth and neat. 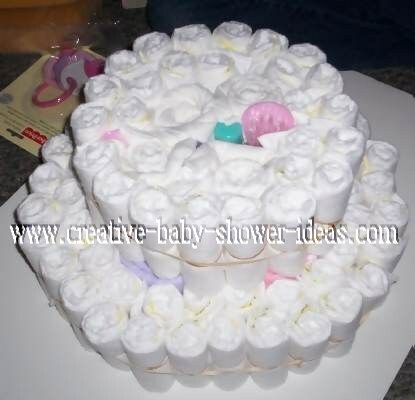 Another thing we did differently was instead of decorating w/ ribbon on the cake we took construction paper and made a ring to fit around each layer of diapers. We then used ribbon and colored "rings" and decorated the construction paper...this way it looks less sloppy and you can use a glue gun because it's not touching diapers. We used crate paper and shredded crate paper to do the icing. We also made little diaper purses. We had to use hot glue so these are for keepsake only. We used a toilet paper roll and lots of ribbon...and put the families' names on them. We even made the dad a duffel bag...lol. This was our first cake and we spent about 25-30 hours constructing it b/c we tweaked it a lot. Total cost for this cake was around $150. This can be easily lowered by using off brand diapers, not having so many "ingredients", and using not so much ribbon or cheaper ribbon. Hope someone finds this cake useful and idea provoking! 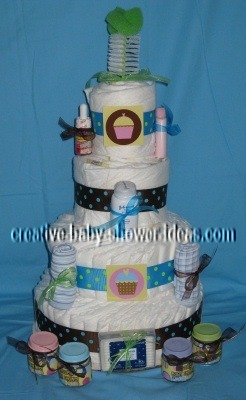 Here is a Jumbo 3 tier diaper cake filled with goodies. I used a baby bottle, receiving blanket, Johnson and Johnson bath products, a spoon and washcloth lollipop. 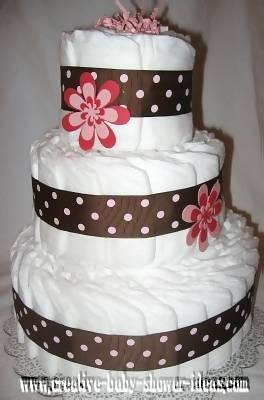 This mod mom cake is made with about 50 diapers velvet ribbon, chocolate & pink polka dot ribbon, and wax dipped silk lilies. 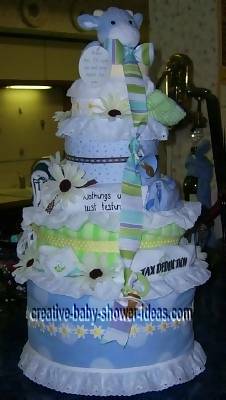 I made this diaper cake for a good friend's baby shower. The size 2 diapers are rolled individually and each secured with a rubber band. Each layer of rolled diapers is secured by a rubber band. Then a receiving blanket was wrapped around each layer. The receiving blankets are held in place by a larger rubber band, and then the rubber band is hidden by ribbon. They layers were pretty stout, so I didn't need a bottle, or dowel rod to hold them in place. The stacked on top of each other really easily. 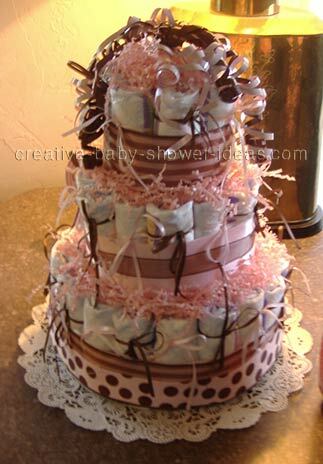 I used pink crinkle paper in between the layers, and decorated the cake with items off the registry. On the back is a bib, a pacifier holder, and some rolled socks that are tied with coordinating ribbon. I was able to tuck a part, or tag, of all the baby items into the large rubber band surrounding the receiving blankets. It held everything in place really well. Secret!! 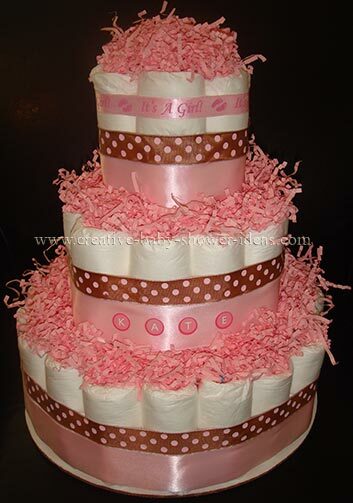 However, each cake is a 3 tier and made with 55-60 premium diapers. All are atop a corrugated cake platter and adorned individually!! 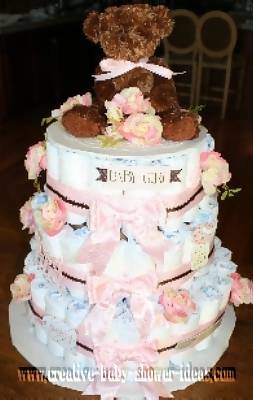 I used a photo album as the base for the teddy bear one with hot glue for the ribbon bows and washcloths around the top. They are so much fun to make... thanks for all your great ideas! 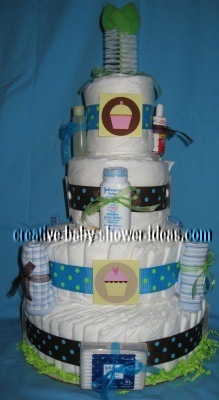 Instructions on how to make this simple MOD MOM diaper cake! * Use clear elastics to roll up each diaper. * On top of the cardboard base (found at any craft store) use the paper towel roll as your center support. * Stuff one rolled up diaper into the top of the paper roll to extend the length. (This top diaper will end up being slightly higher than the rest). 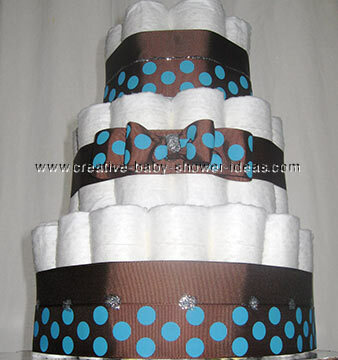 Start constructing each layer of diapers going around the paper towel roll. 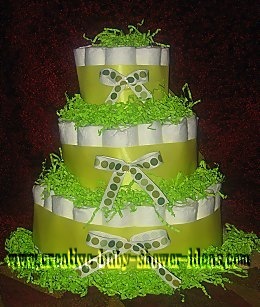 Secure each layer with curling ribbon tied around it. 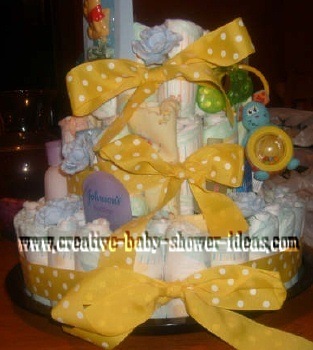 * Cover the curling ribbon with two layers of decorative grosgrain ribbon around the bottom and middle of each diaper tier. * Match the two ends of the decorative grosgrain ribbon in the back overlapping 1 inch and secure with hot glue. 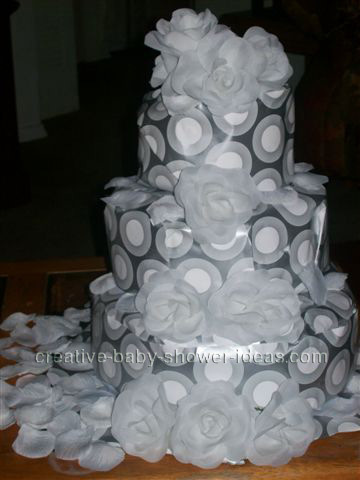 * Decorate the top and each tier of diapers with "shred paper" this will cover any imperfections. 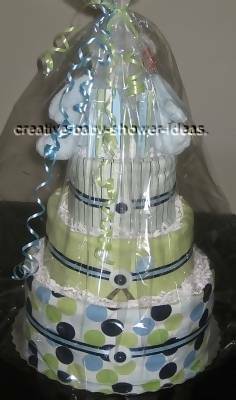 (Just poke it down with your finger) And there you have a simple yet elegant diaper cake that's inexpensive! 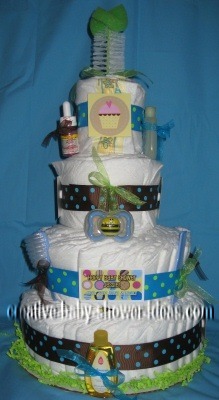 I have designed a line of diaper cakes called Burp Cakes. 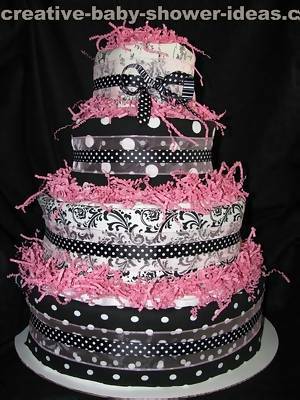 The design incorporated custom burp cloths decorating the cake. 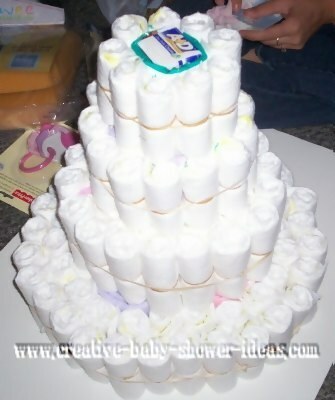 This cake has 120 pampers Swaddlers and four burps. Thanks! 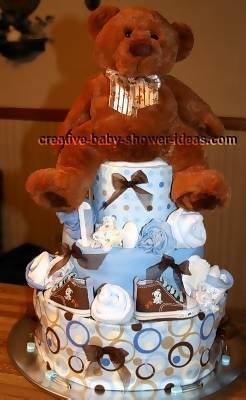 This is a teddy bear diaper cake. This is the first one I have ever made. I used 56 diapers & 4 receiving blankets with all the decorations you see and I love it. Can't wait for the shower. I'm going to give it to an old high school friend with her first baby. I got a lot of ideas from your site. Thanks. 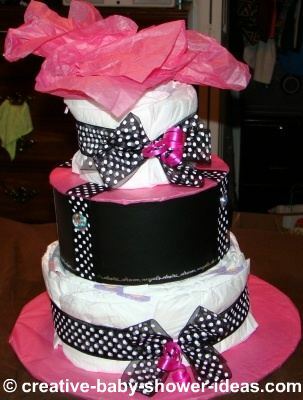 There are diapers creating the entire cake. I then wrapped each layer with blankets, onesies, wash clothes and bibs. After it was all put together I added decorations with ribbon, pacifiers, flowers and a cow on top! 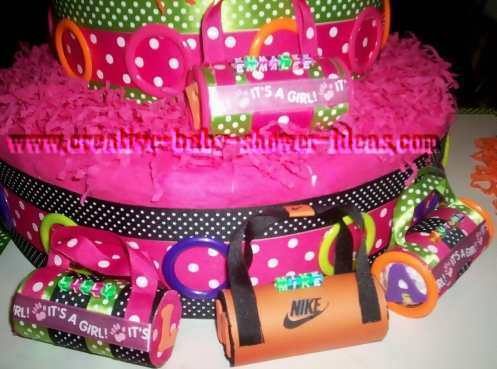 I design diaper cakes. 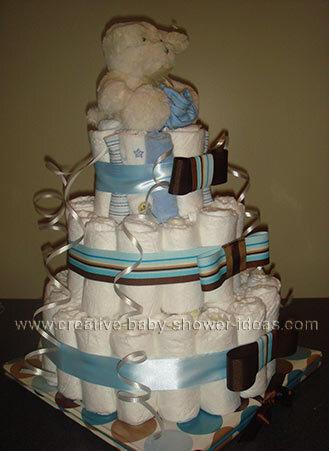 The diaper cake picture is the new "Spring Trendy Cake" by Blue Monkey Designs. 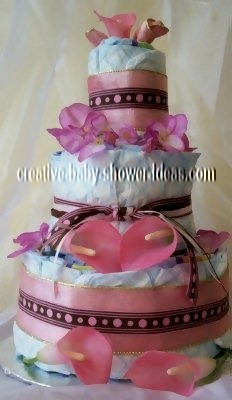 I design diaper cakes and wish to share a few pictures with others! 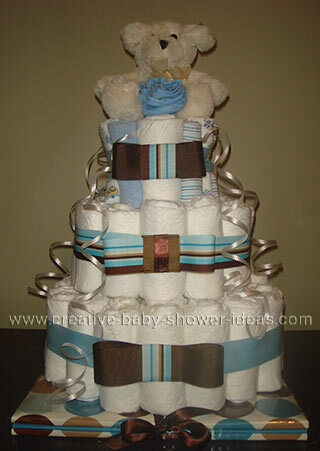 The first diaper cake picture is the new "Spring Trendy Cake" by Blue Monkey Designs. 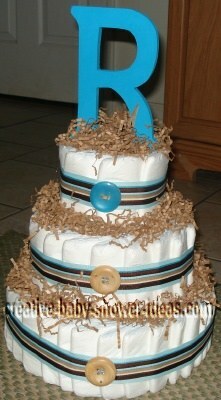 This is a chic baby diaper cake I made for a friend. This is the first one I have ever done. 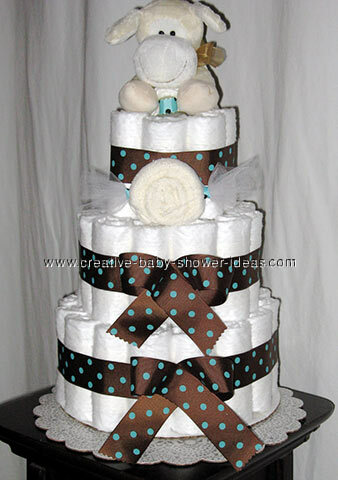 This is a diaper cake I made for my Sister's first baby shower. I kind of "cheated" by not rolling all the diapers, but I think this way keeps the diapers in more useful condition. For the base, I wrapped a box of Newborn diapers with a receiving blanket. I secured it with pins and put rolled diapers around the bottom and secured it with a ribbon. 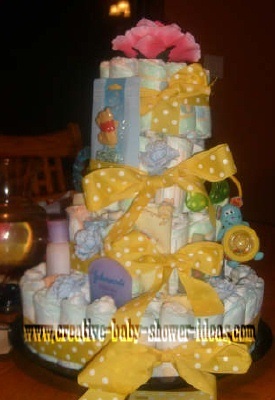 The second tier, I wrapped a box of wipes in a receiving blanket and put rolled diapers around it and secured it with a ribbon. 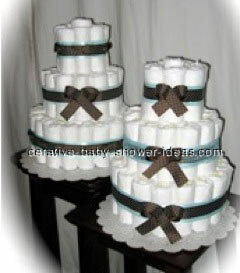 The third tier is rolled in traditional fashion; I added spoons, a bottle as the "topper" and a ribbon. 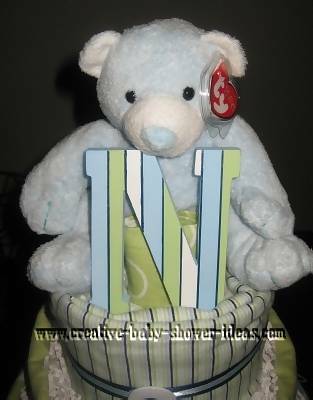 I set the third tier a little off center and put a teddy bear on the side holding the letter "J" for the baby's first initial. I am very happy with the way it turned out. My kids enjoyed helping roll the diapers and putting the rubber bands around them. It truly was an art project as well as a work of art. 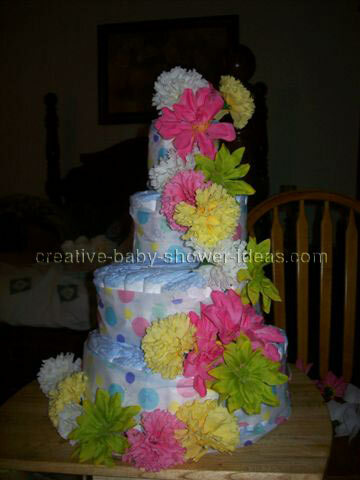 My cake is made out of 90 pampers Swaddlers diapers that are each hand rolled and held together with rubber bands. 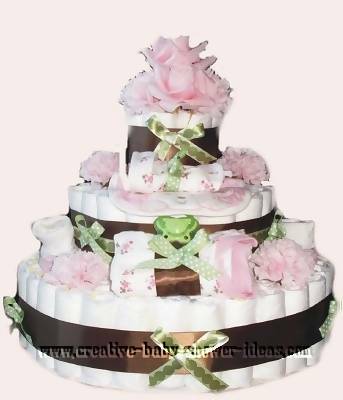 It is three tiers with measurements of 20" wide by 16" tall and 20" in depth. I start by getting a 12" round cake board (corrugated cardboard) as my base. I place a bottle of champagne in the center with a dab of hot glue to hold to the cake board. I then place each individually rolled diaper around the bottle and tie a piece of yarn around the first row to hold together. I repeat this process until I have 4 rows on the bottom tier. Repeat the same steps building a second tier but only making 3 rows. Then do the third tier building only 2 rows. The whole bottle will be covered at this point. I then get decorative ribbon to wrap around each tier covering the yarn that holds the diapers together. I secure each ribbon with hot glue. 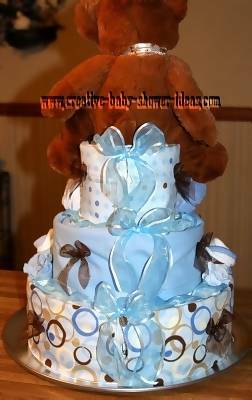 I decorated the second and third tier with a 4 piece layette set. Folding pieces to fit, adding ribbon for decoration. 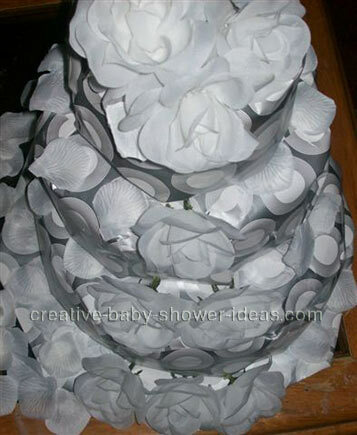 Finally I placed silk roses and carnations as the topper on the cake. When Mom takes apart the cake...SURPRISE! There is a bottle of champagne hidden in the center just for her! !